Are you someone who has a hard time getting going in the morning? And if you are is coffee the only thing that helps? If so then you are probably and instant human that needs coffee added to get complete. 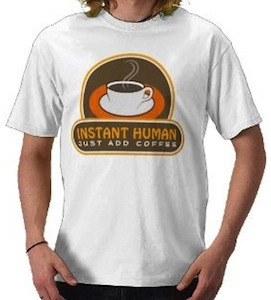 This funny t-shirt is all about that with a picture of a nice fresh cup of coffee and the text “Instant Human Just Add Coffee”. And this super fun t-shirt comes in a range of styles and sizes to fit you and the rest of the family just the way you want it to. Come check this Instant Human Just Add Coffee T-Shirt.